I’m calling this early summer favorites, because the first day of summer hasn’t even arrived and I’m positive we’ll have more of these posts before the season is over and we’re reminded of stuff we love and want to share. But these are always fun (and they’re always perfect for our monthly Scoop giveaways where we surprise a lucky reader who’s commented on a Scoop post during the month!) Here’s a few things I’m loving at the moment. Don’t laugh. Yes, these are crocs. Here me out. I’m a flip-flop girl and I have a lot of different types for different purposes. For example, I love me some Roxy flip flops and usually stock up on those at the start of every summer. Last year on a business trip, I somehow forgot my comfy travel shoes and ended up 47 gates away from my connection in the Denver airport in heels and my feet were KILLING me. Like, so bad I couldn’t walk another step. I was already short on time so I limped as fast as I could to the only place I could see that had a solution: The Croc Store. Of course everything in airports are overpriced and I shelled out $40 (you can find these pretty cheap on 6pm.com and amazon) on the only thing they had in my size that didn’t look like they belonged on a smurf: a pair of unisex flip flops. And they felt like heaven. What I didn’t expect, was that those fuchsia-colored flip flops would become my favorite shoes. I don’t wear these when I want to be super stylish, but comfort? You betcha. They have a wide foot bed (those with wider feet can understand that sometimes that’s hard to come by in women’s sandals) and the way the foot bed is curved and padded, they just feel awesome. If I’m going to be on my feet a lot, or walking quite a bit, these are my go-to’s. And during the summer they’re especially nice because they’re so great at the beach and in the water. LOVE them. As a naturally ghostly white kind of girl, I’ve become quite the expert when it comes to self-tanning and bronzing products. But this isn’t a tanner, it’s just a yummy smelling tinted lotion with a slight shimmer. It’s awesome for when you just want a little glow, and you want it immediately. It adds just enough color to make you look sun kissed, or enhances a natural tan really beautifully. And as I mentioned, unlike most self tanners, this smells really yummy. Find it Here! So, squirt guns are the bane of my existence. Sure they’re fun, but with little kids especially, it’s a constant stream in and out of my house with little voices screaming, “fill this up!” And they’re always breaking, and my kids are always fighting over who gets which one. We got some of these water squirters last summer and we love them. 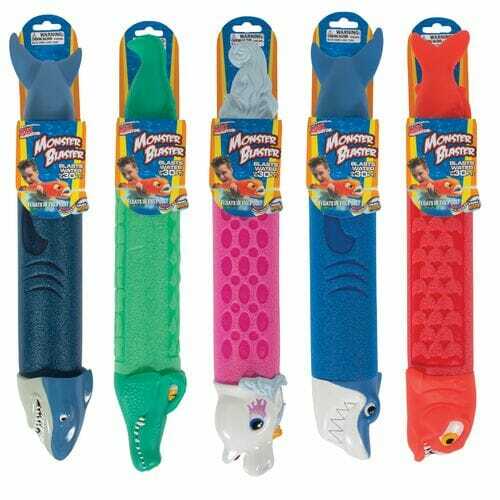 So much in fact, that I tossed most of our squirt guns and bought a ton of these so when kids come over for a water fight, they’re all evenly matched. My favorite thing is that they’re just as easy for my 3 year old to use as they are for my 8 year old. I fill up a giant plastic tub full of water in the middle of the yard and everyone can easily fill up and shoot away. They also float in the pool so they’re fun to play with while you’re swimming. You can find this style of water squirter at lots of places, like Target, or Amazon these days. These became my favorite shorts last summer. If you like them shorter, you can roll them up, and rolled down they hit just barely above my knee (I’m short, but these come in tall, too.) Because I’m short, I have a hard time finding cute knee-length shorts that don’t look like capri’s on me and these hit in the perfect spot. They look really cute dressed up with a cute belt and a wedge heel, or dressed down with flip flops and a t-shirt. And the fun colors are a bonus! It seems they go on sale quite often, and I can almost always find them for super cheap at the Gap Outlet near me. I slather myself in SPF every single morning after getting out of the shower, but one of the things I hate the most is having to re-apply to my face after I already have make-up on. It’s just slimy and gross and ends up feeling cakey. But I’m also a huge supporter and believer in sun protection. Lately as I’ve been seeing the temperatures rise, I’ve been noticing tons of people I follow on Instagram, post pictures of their sunburns as if they’re medals of honor, expressing excitement that it will turn into a tan and summer has officially arrived. It makes me cringe! I’ve had more than one person in my life pass away much to early in life (both rather young mothers) from melanoma. I’d encourage you this summer to take care of your skin and use sun protection! (Alright, stepping off soap box now…) I have really sensitive skin, so I asked my dermatologist about sunscreen in a powder form and he said go for it! I was so excited to find this. I still use a base layer of sunscreen on my face, and I also use a foundation with SPF, but for touch-ups during the day on my face, I’m loving powder sunscreen. It makes it so easy to keep a pretty face, but feel protected from the sun. There are a few brands that make it, and most of them are quite expensive. The one I use is the significantly less expensive that all the others I’ve seen and it’s from Peter Thomas Roth. It’s available in-store at Sephora, or an even better deal through Amazon with Prime shipping. It also comes in a bronzing powder. Lest you find yourself in a stressful conundrum, wondering which S’mores Ice Cream product is better, I am here to lend a thorough review. I’ve put significant time and energy into stuffing my pregnant face thoughtfully researching this issue. Both Dreyers and Tillamook have S’mores flavored ice creams out this summer. When it comes to the actual ice cream base itself, you can’t beat Tillamook. I mean, those guys just know how to do dairy. The chocolate flavored ice cream is super smooth and creamy with a balanced chocolate flavor. While Dreyers has marshmallow pieces, Tillamook has pockets of smooth, fluffy marshmallow-fluff style marshmallow so you can really taste that flavor. The one spot that Dreyer’s has Tillamook totally beat though, is in the graham cracker component. While Tillamook has what I can best describe as chewy balls of graham flavored dough (similar to shape and texture of cookie dough in cookie dough ice cream) Dreyers has ribbons of crushed buttery graham cookie. It’s almost like big pieces of a butter graham pie crust and it’s hands down the best part about both of these ice creams. I will literally dig through the entire container and pick them all out like the annoying child I am. My only complaint is that they don’t put in nearly enough of that part. They should triple it. So really, you can’t go wrong with either, but at least now you know the difference. You better buy both and research for yourselves. Lastly, I’m including the DQ S’mores Blizzard, because, well, Blizzard. They’re awesome, and I love it when they bring back seasonal flavors like this one. I should note that ALL of these options are way better than actual s’mores, which always sound like a good idea, until everyone is completely covered in sticky marshmallow and dirt using the roasters as swords. I have been on the lookout for a pair of supportive, waterproof flip flops for years, I’ll have to check out those crocs! Those s’mores ice creams make me very sad that I can’t do dairy any more. You are a girl after my own heart….all these products are might up my ally. Best of a all!!! When they get wet….they dry soooo quickly. Perfect for the watermark. Yay for Crocs. Awesome! I’d love to try the water blasters with my family!! Comfortable, wide, waterproof, bright, what more could a girl ask for!!!!! You must try BYU Creamery’s Graham Canyon Ice cream!!!! Love these posts!!! I NEED that powdered sunscreen and those water toys. I’m going to have to get some of those water blasters! I hear you about squirt guns! Yes…the big T ice cream is the best! I completely agree with you on the Gap Boyfriend Shorts! I bought some navy ones a couple years ago and loved them so much, I bought khaki and grey last summer! I may just have to get a red pair this year because those look a. ma. zing. Did I miss the pregnancy announcement previously? Congratulations! My kids would love the water blasters and I’d love the crocs. I’ve never had a pair and my feet need that extra support. I am pregnant, too, but pretty close to delivery (oh, I hope) – 3 weeks and counting! I will have to try some s’mores ice cream before D-Day. Yum!! And those crocs flips look perfect for a poor prego lady’s swollen feet. Will have to check those out, too! Premature aging and skin cancer are NO FUN, so thanks for including sunscreen on this list! It’s all about finding a favorite and stocking up. You’re more likely to use it regularly if you love it. Ive been a devotee of Neutrogena Ultra Sheer sunblocks since they came out, but I’m always on the hunt for a new favorite. What great finds. I love seeing other’s favorites. I am especially excited about the water squirters. My 10 nieces and nephews will love them. I never knew that there was a powder sunscreen! I burn really easy so if i don’t re-apply sunscreen after a couple hours I’m a lobster. Also i agree with the Tillamock smokes ice cream dropping the ball on the graham cracker pieces, you want them to be crunchy but then there chewy. I will have to try the crocs flops and the powdered sunscreen. When I put makeup on, I don’t put the sunscreen underneath because my makeup then slides off throughout the day. I will have to try this on top. I am craving everything s’mores this summer. And now I am really thinking I need to try some s’mores ice cream asap! I love when y’all post about some of your favorite items because I get to hear about new products worth trying. Powder sunscreen is great. Might have to try out the crock sandals, they look super comfy. S’mores ice cream, how did I not know about this. I think I need to go to the store right NOW. I love the powder sunscreen. That would be great at the beach. I need to try those crocs. They look super comfy and my old flip flops just bit the dust. Thanks for the recommendations! Awesome! Thanks for the heads up on all these fun things! Powder sunscreen? Have to try it. Oily skin + sunscreen does not mix! Clearly I have some shopping to do. I need comfortable, non-hideous wide flip-flops. I need powder sunscreen. I definitely need those shorts. And I always need ice cream. Don’t we all? Thanks for the tip on powdered sunscreen. That is awesome! Thanks for the tip on the great flip-flops for my feet that are almost as wide side-to-side as they are long from front to back :)To my fellow wide-footed women…try the ALTRA running shoes…also bliss!!! My Mom is the biggest lover of Crocs….like ever! She would love to hear that she has a “Croc buddy” 🙂 Also, I am a flip flop fanatic and might have to try those. I am glad you posted those shorts. It’s hard to find styles that are not too young or too old. Thanks! Wow, these are all great! Gotta try the powder sunscreen. I looove Crocs, they’re so comfortable! I’m dying to try that blizzard now too. mmmm. I love the water blasters! Also the shorts look great. When you are short it is so hard to find shorts that are long enough but not too long. Thanks for the recommendations! The Croc’s sound great. My feet have issues so this is perfect for me. I really want to try that powder. As I get older, and maybe a little wiser, I’m realizing the importance of a good sunscreen! Friendly reminder this summer…Readers: please be careful when filling up that “huge bucket ” of water, especially around the little 3 yr olds. Supervision at all times please! We had a near tragedy on our block this week. Definitely have to look into that powdered sunscreen!! We have those same water blasters. We’ve had some epic water fights with them. Usually somebody gets the hose and somebody else gets the bucket. It didn’t turn out so well for me when my brother dumped the bucket of water on me a couple of summers ago – my postpartum bladder couldn’t handle it. But everybody got a good laugh! I need those flip flops…and the powder sunscreen…and my kiddos would LOVE the water toys! I had never heard of powered sunscreen! I’m excited to try it out! Thanks! Yay! I love your season favorites! I’ve been loving those Gap short’s too. Everyone always asks me where I got them. Those crocs look so comfy! I had never heard of powdered sunscreen either – cool! Just tried the s’mores blizzard last week, so delicious!! I’m always up for trying any/all ice cream flavors. Love the s’mores ice cream. We have only tried the Tillamook kind though, so we’ll have to try the others! Can’t wait to try out the VS lotion as I love their products as well! Also, totally random, but in my mind you did a post about s’mores last year with strawberries and nutella and it sounded delicious, but we just didn’t have time to try it out last year. I’ve tried searching for it on the site and just can’t track it down. Am I totally imagining that post? S’mores are the greatest treat in the universe and probably best in ice cream form. I love that the dryers comes in slow churned too! That way I can eat twice as much. I dig for the crunchy graham stuff too. Please recreate it and share on your blog! I would try but I know I’ll fail and I pretty much trust you and kate with all things culinary. Those Crocs look awesome. I have the ones that look like Church flats and I love them, they saved my feet when I was pregnant last summer. Make sure you try Tillamook Mudslide, our family’s favorite flavor. I am excited to look into the powder sunscreen. My skin is pretty sensitive, so this may be just what I need! I love reading about your favorites! I love these posts! I love to see others favs and those water boasters sound like the perfect solution for letting my two year old in on the big kid fun. I am a huge fan of crocs in general, so I love that these made the list. Plus…. Powdered sunscreen?? This is a revelation for me! I am always looking for new flip flops, thanks for the recommendation! As a wide-footed gal, I thank you for the sandal recommendation. No shame! This stuff all looks so fun! Especially the ice cream– I need some inspiration for my new ice cream maker… actually, I don’t need an excuse for ice cream. I just eat it! Amazon here I come! Thanks for the tips!! Sara- TOOOOO funny that you listed the croc bands as your fav shoe – I broke a toe a few years ago in the wintertime and needed a comfy pair of flips to wear and could only find these online because no one sells flip flops in the northeast in the middle of winter! Any whooo- fell in love with how comfy these were and bought them in 4 colors and they are also my go to flip flops all summer long- usually get a funny tan line but don’t care because they are so darn comfortable!!!! I read your blog daily and love your shop- the bacon olive oil is to die for! Love what you and Kate do- Have a wonderful summer! Congratulations on baby #4, that is so Awesome! This list looks great! Water blasters + big bucket of water = fun for everyone! And an extra bonus for moms. :). Those flip flops look wonderful. I love flip flops as well and have a hard time finding comfortable ones. The Cross flip flops are awesome.. Both my kids and hubby have a pair and love them. I’ll have to get some too! Thanks for the suggestions! I am totally trying the VS tinted lotion and my 10 yr old gives the S’mores blizzard from DQ a thumbs up! I can’t wait to try the sunscreen. I need to remember to ask the next time I meet someone who works at Amazon (I live in Fernley where there is a warehouse) if they know when someone posts a new blog post due to an influx of orders. Like after your bubble post all of the orders with Jlube and glycerin at the same time. 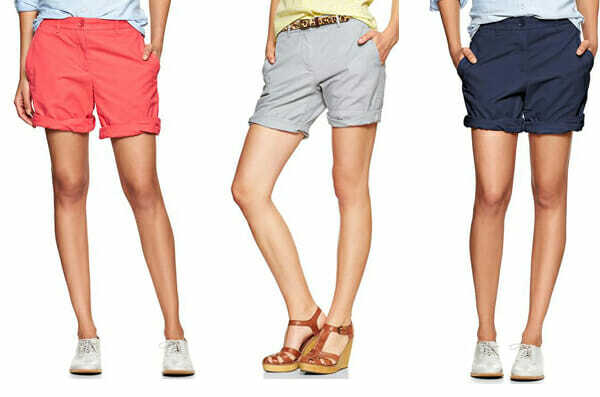 I LOVE the gap shorts, and bought 4 pairs last summer. I wear them unrolled, but I had to hem the legs to make them a little more fitted, otherwise they were quite balloony! And this from a more substantial-sized thigh girl 😉 I’m moving to Guam this summer, so I might have yo pick up some more colors! Thanks for the tip about the powder sunscreen! My skin is going through a shift, and I’m having to revamp my entire skincare regimen. I have to say I love s’mores despite all the stickiness, but I’ll have to try these ice creams! I seriously have to try that ice cream! Smores are a big part of my summer. I grew up with the old standard chocolate, marshmallow, Graham cracker. When I married my hubby I was shocked when his familt pulled out store bought chocolate frosting instead of the bars. For real! It is sooo much better! Awesome! I have wondered if those crock flip flops are good. Now I know! Thanks! Thanks for sharing. I’ve wondered if my 3 year old would be able to operate those sprayer things and now I know! I am a croc person. They saved my feet when I worked in a nursing home. I will have to get some of their flip flops for my very swollen pregnant feet. .. 8 more weeks. .. Totally intrigued by the powder sunscreen! I try to take care of my skin too! What type of sunscreen do you use for everyday? I’ve been trying to find one that I like, and I’m not having much luck! Love the Crock flip flops! I’ll definitely need to check those out!! So many cute things, thanks! But what I have to comment on is that I was surprised to read that you are short! I pictured you as tall. Tall or short, my whole family loves your recipes! I never thought I would say this, but I just bought a pair of crocs. I keep wanting to type “crocks.” Thank you for the wonderful suggestions, especially on the ice creams. I went to Amazon and ordered the sunscreen powder right away, what a great idea! As a fellow pale girl who sunburns easily I am very thankful for this find! I’ve always depended on the sunscreen in my make-up to be enough but it has failed me several times.I also have a problem with my skin breaking out. I’ll definitely look into the powder sunscreen! I like the idea of that powder sunscreen. I’ve heard that there are sunscreen wipes which would making applying to little ones so much easier. I need to find those! Thanks for the list! I would love the Crocs! 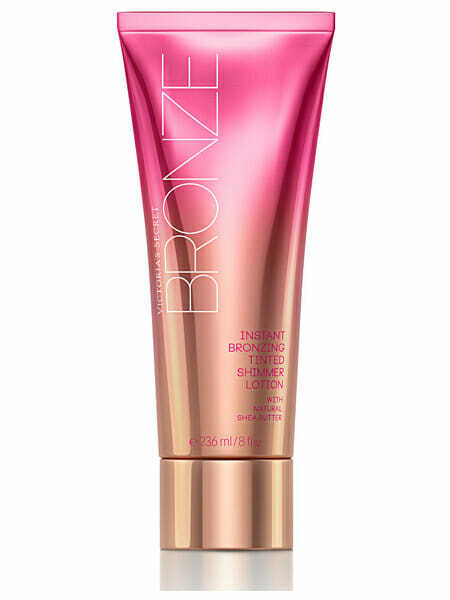 I am most excited about the bronzing lotion – I will have to pick some up this weekend! That Dreyers s’mores icecream is my favorite! You are right, the graham crackers in it are so good! They are my favorite part! We love those kinds of squirters too. My 2 yr old thinks it’s awesome that he gets to actually participate in water fights now. powdered sunscreen!! I need to give this stuff a try. Thanks. Crocs saved me so much when I moved across country 7 years ago. I developed an autoimmune disorder where I would get very painful swelling in weird places, like my feet. I found that on our huge expanse of tile floor Crocs allowed me to walk without pain. They are great! Smore blizzard is awesome. I will have to try the water guns. Those look like some fun options versus the others like you said you have to refill every 10 seconds. Thank you for the list! I think I will have to try some crocs, a lot of flip flops are not very comfortable. Thanks for sharing! I will definitely be trying some of those! What a great list! I’m a huge sunscreen freak too! Powdered sunscreen is exactly what I need! Melanoma is a huge fear of mine after having pre-cancer spots. Did those you know who passed see a dermatologist for skin checks or did it just advance quickly? Love the water blasters and the shorts!! I never would have thought to check out crocs, thank you! I have already ordered a pair for my kids to give me for my birthday….what. Is that wrong? Great stuff…crocs…whoulda thought? Look good though! Would love to hear your thoughts on self-tanners! Will have to check out the sunscreen. Thanks – I always love your posts like this! I just had my favorite pair of flip-flops break. I’ll have to check out the crocs. Thanks! I love Crocs. I admit it. They are so comfy and they actually have some cute styles. Now I need a pair of their flip flops, and the water squirters. I hate having to refill the water guns all the time too! Ok, it makes me so happy to read your blog and know there are kindred spirits out there. I HATE refilling water guns, love me some flip flops, shorts and ice cream. and congrats on the pregnancy! You both make me laugh every time I read, so thanks! 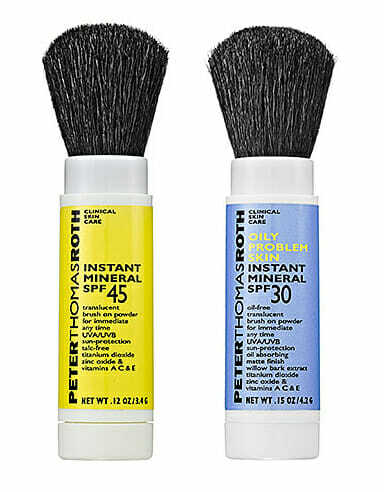 What a brilliant idea…powder sunscreen! I have very oily skin so the powder sunblock sounds like something I could use. Ooh I have wide feet and am always trying to find wide shoes. I’ll have to try crocs! I love that you love crocs! I have never owned a pair but I hear they are WAAAAY comfy! I also know that some people…when their feet get wet in shoes like that..their feet tend to “fart”! It is hilarious! But I am sure yours don’t! I love me some great ice cream! But I love Bryers or is it Dryers?! I love that they make lactose free ice cream! I mix in peanut butter and some chocolate chips (lactose free of course) and I have something yummy like the other kinds…just safe for me! If you are ever in SL/Murray Utah, there is a smoothie place that is to Die for! Roxberry is delish…and they have the bestest frozen yogurt! Those water blasters are so cute! We don’t do ” toy guns” in our house so those would be perfect!!!! It all looks good! Thanks for offering this giveaway. The water blaster a would be a huge bit with my eight-year-old daughter, and my feet would love to try the comfy Crocs!!! Those shorts are so cute! I loooove flip flops. I wore them year round when we lived in Galveston, TX, but now that we’re in Ohio my flip flop season is significantly shorter. 🙁 I’ve always thought crocs were ugly, but I didn’t know they made flip flops! Going to have to give them a try! Ditto on the importance of daily sunscreen! Going to get me some of this powder to try–croc flip flops sound comfy! I am definately going to try the crocs flip flops. Thanks for the recommendations. I have a wider foot also, and found a brand of very supportive all-one-piece constructions waterproof sandals from a company called Okabashi a few years ago. I have found them at my corner Walgreens for several years in a row, and this year I found the Okabashi flip-flops there, too! 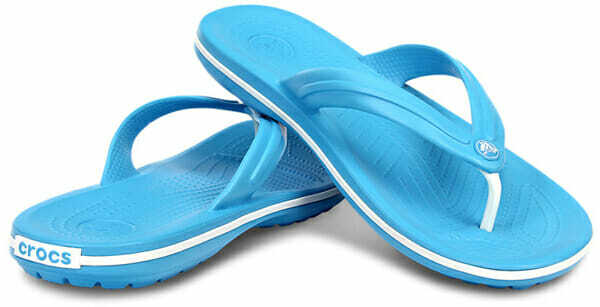 They are similar to the croc flip flops, and the Okabashi ones also have foot massaging nubs in the footbed. Some people don’t care for them, or it takes them a while to get used to them, but I love them! I believe they are supposed to have at least a 3 year life, and you can send them back to the company for recycling when you are done with them. Thanks for taking the bullet on the s’mores ice cream for us. I will definitely be hitting the ice cream section this weekend while my hubby is out of town for youth conference! Girls’ Night! We just tried the Smores Blizzard’s yesterday – holy huge chunks of chocolate, batman! Those are good! I have some basic croc flip flops, and I like them. But my SIL handed down some fitflops to me and I LOVE them! I have always been a tennis shoes for long walks kinda girl, because my feet hurt in anything else. But I can walk for miles in fitflops and my feet never hurt. I looked them up and they are quite expensive, which is another reason I’m grateful for my SIL because I never would have dished out the money for these before knowing how great they feel. I’ll have to try the VS Bronzing Tinted Shimmer Lotion, thanks! So 7 summers ago I was pregnant with my first baby and was desperate for comfortable shoes that I didn’t have to wear socks with (I live in the southern California desert). I bought a pair of Crocs because they were comfortable but hated the look. Fast forward, THIS summer I am pregnant with our 4th and those 7 year old crocks are still in one piece but so not comfortable anymore. I think I know the solution! Super excited for Croc Flip Flops! Perfect combo of style and comfort and EASE!! Thanks girls!! I had no idea they had spf in powder form – total gamechanger! I love flip flops, but my feet don’t! They need better support. It sounds like I need to try Crocs! Gotta find me some of those shorts! My summer time is in need of a bust!